With a vast number of options to choose from, an Ultraframe conservatory gives you the extra space you've always dreamed of, no matter what your conservatory design requirements might be. Ultraframe conservatories are the perfect way to bring the outdoors indoors, providing an elegant focal point for get-togethers or a warm and welcoming place in which to relax and unwind. 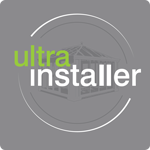 For a cost effective bespoke modern conservatory design, look no further than Ultraframe. With an extensive collection of conservatories to choose from, you can be sure to find the right style to suit your home. Choose from a glass conservatory to a more modern conservatory style and create your ideal living space. Or if you need to upgrade your existing roof, then we can help you with that too! The performance conservatory features the latest super insulated column technology which is 5 times more thermally efficient than standard brick columns. The inclusion of the decorative cornice gives a sense of grandeur to the conservatory externally, and internally, the plastered columns and insulated pelmet give a cosy room like feel. A designer conservatory with added style and shape on the outside and a 'room like' feel on the inside. An ideal home improvement solution for any property. On the inside, the insulating perimeter ceiling pelmet improves thermal performance, houses lights or speakers and gives a more 'room like' appearance with a plastered finish. Externally you can choose from a range of cornices to add style and shape to the building while hiding the gutters. The Classic conservatory incorporates the latest technologies in roof and glazing design and can be complemented with a range of optional extras. Choose from traditional or contemporary styles and bring your garden into your home using full height glazing and French doors. Full height glazing in anthracite grey gives impressive views of the garden and matches the paintwork on the house. Five times more thermally efficient than a brick column, these large grey columns in a plain finish are available in any colour to match or contrast with your property. Also available in a fluted finish for a more period style. A curved cornice in anthracite grey adds style and shape to the roofline and hides the gutters. Available in any colour, there are 4 styles of cornice to choose from. High-Performance glass reduces solar glare and retains heat to reduce heating bills and ensure your conservatory is a comfortable temperature, whatever the weather. Choose Quantal Aluminium or Classic Roof in any colour. Design a stunning glass conservatory using our Classic roof and fill your room with light. Our roof systems are compatible with almost any building configuration, which means that you won’t be restricted by choice when designing your room. Complete your design by choosing high-performing glass. Our glazing will stop your room overheating during summer; it will also prevent it getting too cold when winter arrives. Keep your conservatory extension warm all year round by choosing Ultraframe. Features like our super-insulated columns and insulated pelmet will help keep your new room comfortable. Our conservatories include a 10-year warranty for our customers' peace of mind. In the unlikely event that something is wrong, we’ll be able to put it right for you. Grey uPVC double glazed sealed units on a dwarf wall. A curved cornice in anthracite grey adds style and shape to the roofline and hides the gutters. Available in any colour there are four styles of cornice to choose from. High Performance glass reduces solar glare and retains heat to reduce heating bills and ensure your conservatory is a comfortable temperature, whatever the weather. Block out unwanted solar rays during summer to keep your conservatory cool. During colder weather, enjoy glazing that will stop warm air escaping. Every entry in our range has been tested and designed to reward our customers with warm and comfortable rooms they can enjoy year-round. Further personalise and improve the performance of your new conservatory room by choosing from a range of options. Our designs come with a 10-year warranty that will cover our customers in the event of an unforeseen issue. 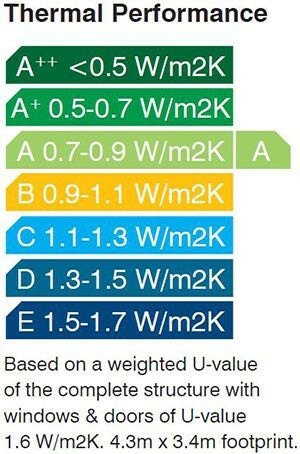 Ask your Ultra Installer for details. White uPVC double glazed sealed units on a dwarf wall. Matching French doors open out onto the garden bringing the outside inside. High-performance glass comes as standard with our conservatories. Enjoy a room that's the perfect temperature all year, leaving you to relax or entertain. Your newly installed conservatory will retain heat and reward you with lower running costs and a reduced carbon footprint. Build a room that looks and feels the way you want it to by selecting from our portfolio of enhancements. Enjoy a 10-year manufacturers guarantee that you can refer to in the unlikely event of an issue. 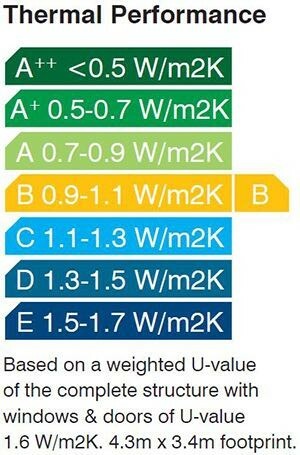 Your Ultra Installer can provide more details. By adding a conservatory to your home, it will not only give you the extra space you have always dreamed of, but it will bring the outdoors into your home to create a unique living area that can be enjoyed all year round. This means that you'll be able to invest in a new addition to your home that continues to bring value throughout the year. Whether you’re looking for a replacement conservatory or starting from the beginning, we can help. Our conservatories are designed to overcome planning permission and building regulation issues. This means they can be installed without fuss, so you'll be able to enjoy all the benefits of your new room sooner rather than later. A conservatory will provide a versatile space. We offer conservatory designs that can be anything you want them to be - a relaxing living area; a dining room to entertain friends and family; a play area for the children; an office or luxury kitchen. The Cornice delivers an ultimate 'WOW' factor, elevating the overall look into something really special. Now available in 4 different design styles to create an orangery look, our Cornice allows you to bring a finishing touch to your conservatory that exudes style and charm in a way that has been tailored to suit your home. Our cornices can be fitted as a 1-, 2- or 3-tier addition. Single tier cornices are the ideal option for smaller builds; double tier cornices offer a contemporary look for a wide range of property styles, and triple tier cornices are the perfect solution for bi-fold doors and our super -insulated columns. We also offer a curved decorative cornice to accommodate more traditional builds. These clever components are designed to turn a simple design into something unique. Combining super-insulated columns, a cornice and an internal pelmet delivers a stylish yet, contemporary orangery aesthetic for your new room. Utilising contemporary techniques and premium grade materials, our super-insulated columns are a cutting-edge option for your home. These high-performance columns feature powder coated, coloured aluminium cladding panels to reflect the look of the classic architecture found during the Italian Renaissance. This feature enables you to bring traditional charm to your home that has been updated to meet the expectations and requirements of the modern age. Although our super-insulated columns look stunning, they are robustly constructed and will deliver a range of practical benefits. Each super-insulated column is surrounded by an OSB board that is fixed on to the battens. Around the outside of the structure, a porous membrane is added, along with powder aluminium claddings. Superb performance is delivered by our super-insulated columns, which can deliver thermal efficiency levels up to 5 times higher than a brick pier of the same size. 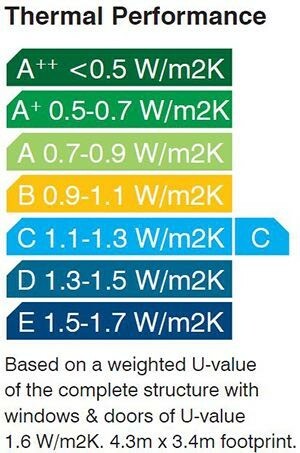 A U-value as low as 0.15 is achievable with Ultraframe's super-insulated columns, which means your conservatory will be warm and comfortable. The internal pelmet not only insulates the eaves, it also creates the perfect housing for spotlights and speakers, enabling you to create an elegant, warm space for relaxing or entertaining. This completely configurable internal soffit allows you to capture an eye-catching 'room-like' feel for your conservatory that further enhances the heat retention potential. This pelmet can be used to house a selection of lighting options, as well as speakers, to bring a harmony between function and form. Featuring a high-quality plasterboard finish, this pelmet will blend in seamlessly with your conservatory design to enable you to bring a new addition to your home that exudes class. Our conservatories will continue to deliver long after installation, increasing the value of your home. We'll use a tailored and technological approach to help you create a conservatory design you'll love. Avoid damaging damp-related problems in your conservatory by following a few simple steps. A list of the conservatory questions we are asked the most, all in one place. A history of the conservatory from Ultraframe UK. Ultraframe rose to meet the challenge posed by this conservatory project, thanks to the support of one its trusted installers. Looking for More Conservatory Inspiration? View our beautiful image library of conservatories. The family featured in this case study loved their conservatory, which they were able to use all year round. A well designed conservatory will reward you with a space that can be used all year, all day. Barong Windows carry out a house extension for Brenda Bowler, based in Horley.